Before AAMCO’s trained technicians begin repair work on your vehicle, we give you a point-by-point service recommendation and cost estimate, so you know exactly what’s being done to your car and why. After your repairs are done, you can rest assured that your vehicle will run well, and we offer a warranty on our parts and workmanship. Persistent check engine lights, oil leaks, filter problems, alternator issues, and other general auto services are all within the scope of AAMCO technicians’ training. Our specialty is rebuilding automatic and manual transmissions, but we are also experts at brake service. At AAMCO, we pride ourselves on our nationwide reputation, which is why we only hire the best technicians to work on our customers’ cars. The diagnostic tools and repair equipment in our shops are always state-of-the-art, so we can use the quickest available methods to identify and correct any problems with your car. If you need a new transmission or another major repair, we will tow your vehicle to our shop free of charge. 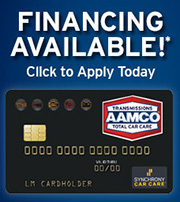 If you can’t afford the service you need, we can offer you a financing plan after we get credit approval. Our warranties are unbeatable, whether you are an individual customer or manage a fleet of vehicles. AAMCO Transmissions and Total Car Care of Chattanooga is the place to take your vehicle for any transmission or general repairs, whether it’s a car, truck, or SUV, foreign or domestic.